SB: What is the Artisan’s Asylum and how did it begin? 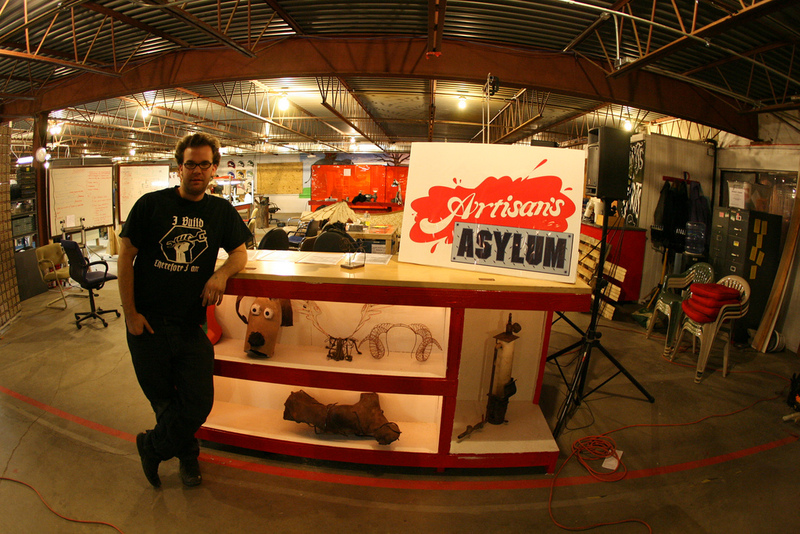 GC: Artisan’s Asylum is a community craft workshop in Somerville that offers classes, access to equipment, and studio rental space. We’re outfitted for wide variety of media: we have woodworking, metal machining, welding, screen printing, electronics and robotics, sewing and fiber arts, and a bike repair shop; and we’re still expanding our capabilities. I started the company a year ago with my partner, Jenn Martinez, because we desperately needed a space where we could go to build and make things on our own time. She’s a costume designer, and I’m a roboticist – we both missed the resources and camaraderie that our colleges’ shops had offered. So we decided to buy some equipment, rent a 1,000 square foot warehouse space zoned for manufacturing, and invite our friends to join us. Then 100 people showed up to our open house, and we realized we were on to something much bigger. We expanded into a 9,000 square foot space within a month of opening, and a year later, are moving into a 25,000 square foot space, incorporating studio space for more than 80 artists, artisans, manufacturers, inventors, and tinkerers. SB: What is your favorite part of the Asylum? GC: There are a lot of things that can stop someone from following through on a creative idea. They can lack the money, the equipment, the materials, or the space — these are the obvious elements. The best part of the Asylum is that it provides not only those things, but the additional secret ingredient: a supportive creative community. I’ve found that if no one knows or cares about what I’m doing, if no one notices whether or not I work on my project, if I get no positive feedback from someone coming by and being impressed by how far I’ve come — it’s easy to let the project slide, and never follow through. The Asylum offers the community element that many artists, engineers, makers, inventors need to keep them going through all the difficult and tedious moments in the creative process. 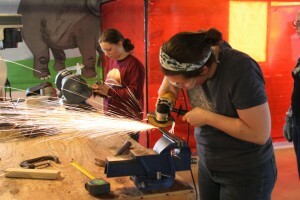 SB: What types of projects/classes are currently going on? 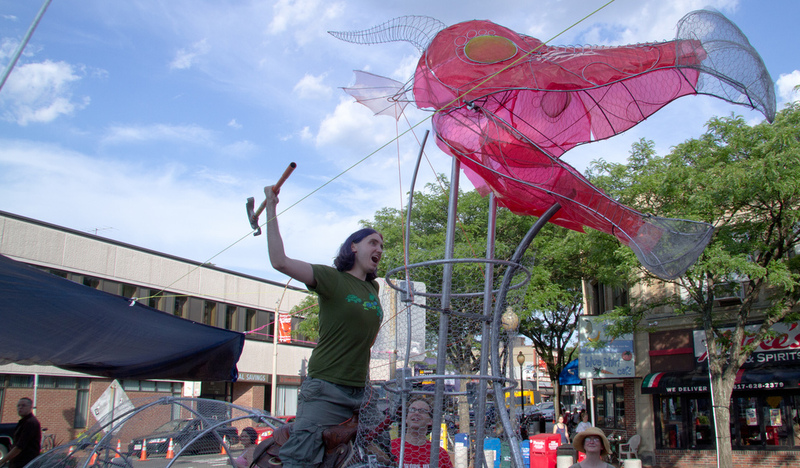 GC: We just finished a big project for the Somerville Arts Council’s ArtBeat and the Hungry Tiger Festival — a story-tall, 30-foot-long dragon, made mostly from conduit, chicken wire, and colored plastic film. You can ride on its back and pull on the reins to make it roar, and for the Hungry Tiger Festival, which was at night, we had it lit from within — festival-goers were lining up to get a ride. It took 30 Asylum members a week’s worth of work nights to pull it together. Right now we’re in the middle of moving from our current location at 13 Joy Street to our new space at 10 Tyler Street, so we’re closed to the public until we reopen in October. When we do open up again, we’ll have some of our classics (welding, sculptural metalworking, intro to sewing, intro to woodworking) as well as some exciting new offerings. SB: Does the Artisan’s Asylum have exhibits open to the public to come visit? GC: When we open in our new space, we’ll have an ongoing exhibit of selections from our members’ finished work in our entryway, which will be open to the public. If you contact us in advance, you’ll also be able to arrange for tours of the whole shop, where you can see the various workshops and take a peak at what some of our resident studio renters are currently working on. SB: Are there any community based projects that the artists work on together? GC: There often are. This is one of the most exciting parts of Artisan’s Asylum. 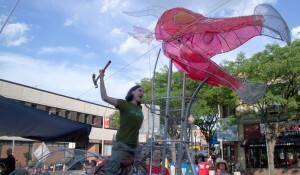 As I mentioned, the dragon we created for the Hungry Tiger Festival was a community project. Two of us designed it, but probably thirty different people worked on it at one time or another. We’ve also carved giant pumpkins with chainsaws for Halloween, created marshmallow shooters for the Fluff Festival, and organized a snow-art flash mob after one of the snow storms last winter, to name just a few. We hope to have communal projects like these going all the time this coming year. We love to have people come and get involved! 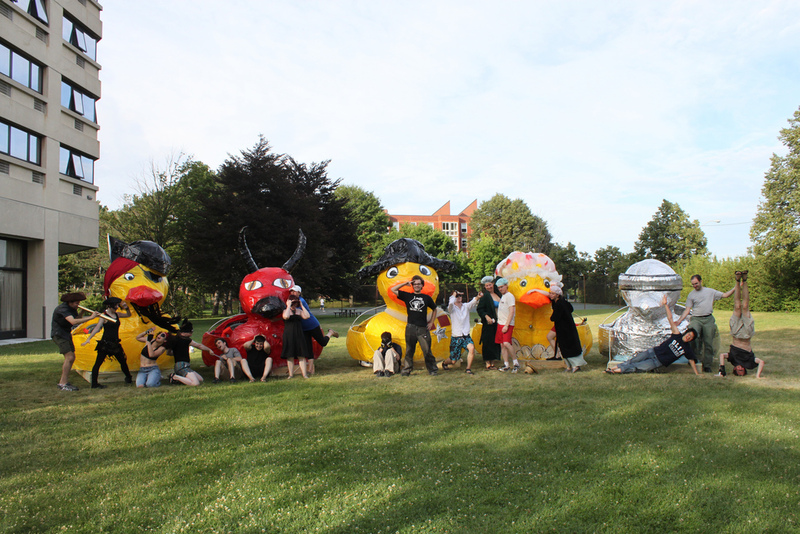 SB: What was your most memorable moment at the Artist’s Asylum? GC: Definitely the ducks. Last year, for the Fourth of July, we built a fleet of rafts in the shape of giant rubber duckies to send out on the Charles for the fireworks. Each one was about 13 feet tall, seated 4 people, and had a distinct persona (The Flying Duckman and Commander Quack, for example, were two of our fleet). We built them in our (then) shiny new empty 9,000 square foot warehouse space, which even had a loading dock… which happened to be on the second floor. 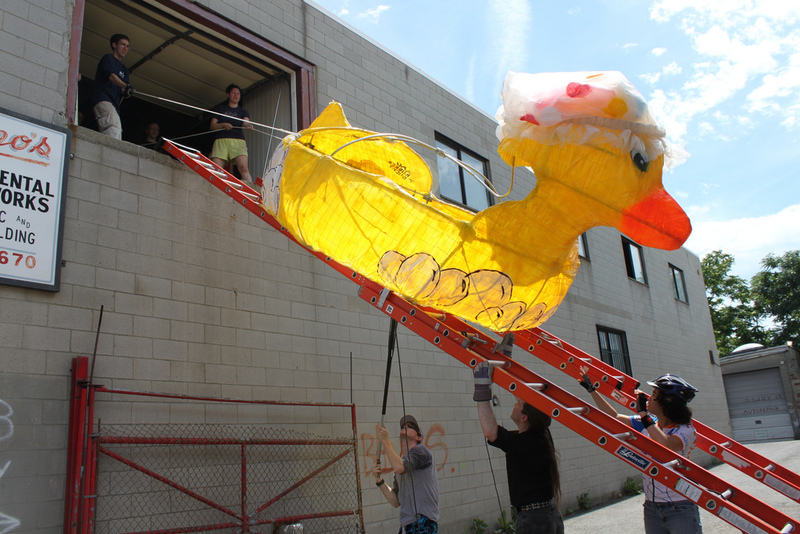 I will never ever forget the afternoon we spent sliding all five ducks down extension ladders from the second floor, packing them perfectly into the box truck, unloading them at MIT and then launching them into the water to the delight of the crowds. Some were less delighted. Supposedly, the Coast Guard was on the lookout for us this year. We laid low — have to retain the element of surprise if we’re to maintain our reputation.